We are happy to have Paolo Sartori as our featured guest photographer this month. We appreciate that he gave us some of his time and generously shared his beautiful photography with us! Please visit his links to see more of his work, and to let him know you enjoyed this interview. I always had the need to stop the moment, to get an image that could tell something to other people. This was only a hobby back in the days; I studied electronics and then I was on the way to get my graduation in music when I started shooting with professional climbers getting my first published images, and I suddenly realized that was what I wanted to do in my life. :: What drew you into adventure-sport photography? Being raised in the heart of the Alps was natural to have the mountains as a playground since I was a child. Mountains are my happy place. So it was natural for me to shoot mountain adventures. :: There’s obviously a huge degree of technical knowledge with both the gear and some of the sports you document. Can you talk a little bit about how that plays into how you work on a shoot? Most landscape photographers are able to just roll into their scene spend some time searching a composition, and then shoot…you have to do that, plus remember all the technical aspects of climbing, plus tell a story about someone who is involved with completing their own endeavor climbing…that has to be difficult. For sure there are a lot more variables than shooting only landscapes. To get on certain places you must be really fit and with a great knowledge of climbing techniques and rope work. You must be with the athletes while carrying all the camera gear, and you must be ready to shoot at any moment. I try to be up before the athletes in the morning in order to shoot them as they step out of the tent for breakfast and I stay out late shooting the moment they get into the sleeping bag. You really need a lot of different skills and a big motivation to do that. 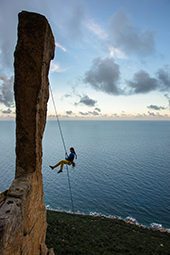 :: With the popularity of adventure sports, and movies like ‘Free Solo’ do you think there’ll be in influx of more people trying to get into this kind of photography? If so, do you see it getting more dangerous for photographers like yourself who have been doing it for awhile? 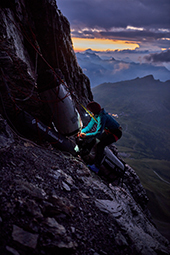 You see stuff like this happen in places like Everest, where it becomes popular then there’s an influx of amateurs trying to do things they might not be prepared for…I’m curious if that could happen with climbing photography. 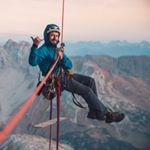 It’s true that these adventure activities are becoming more popular these days, I think a good part of this is due to the spectacular side of it you can see in social media… Instagram shows only the good days and often people don’t realize how much effort and preparation it goes before being able to get there. I don’t think there is a real danger that people will try to emulate Alex Honnold anyway, because they won’t even be able to step up from the ground without many years of training and dedication. It’s the same for adventure photography: you can’t just grab a camera and go, you need first to develop a lot of skills if you want to shoot this kind of sports. 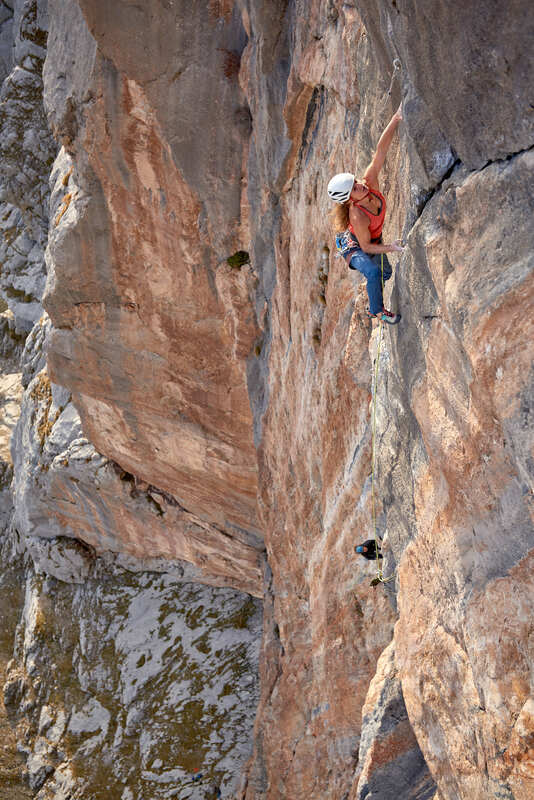 :: A follow up question, semi-related to the movie Free-Solo…how do you deal with the fact you’re in a position where you could literally watch someone die or be injured yourself? Let’s be clear: very few people in the world are able to climb free-solo (without ropes or other protections) and only Honnold set the bar that high; usually people are risking way less. That said, I shoot with professional athletes that are really good at what they do, and I constantly train to be up for any task, so that we always have things under control. Of course there are always some risks you can’t plan for, but I feel confident to say that when we’re out shooting even in extreme conditions the risk for the crew is pretty minimal. :: What other kinds of photography do you enjoy? What inspires you when you’re looking at other work? I really like to shoot portraits and stories of people. I do have some personal projects on the way where I’m trying to step out of my photographic comfort zone to see where the creative process will take me. I can’t tell the details now, but I hope to publish the shots over the next year. About other photographers work, I always love to see photographers creating new things, especially experimenting with light. Doesn’t matter if it’s landscape, fashion, street or anything else, I think light is the most powerful tool we have, it can really make the difference from a flat snapshot to an iconic image. A multi purpose knife; super helpful in a lot of situations. Oh, and a good book; I would never travel without a book. :: What is the scariest thing that has happened to you while shooting? I was in Yosemite, CA, shooting on El Capitan, 2000 feet from the ground. I was hanging on a rope for a few hours and when I jumared up to the top I found a sharp edge had almost completely cut my rope; I guarantee I always used rope protections since than! :: Social Media, I’d think especially for a photographer like yourself with a lot of sponsors and products to photograph is a must…but the popularity of the platform lends to so much ‘copying’ and I think unoriginal ideas that I wonder how someone who gets paid to create content A) keeps their ideas original and powerful and B) keeps from having amateurs who are willing to work for gear or mentions take their clients. Yes, sometimes it’s annoying, but it’s the way it goes…and there is a simple solution: to always set the bar higher. I’m constantly trying to learn everything I can to improve my photographic skills and I spend up to 20 hours per week training to keep up with the athletes I shoot. 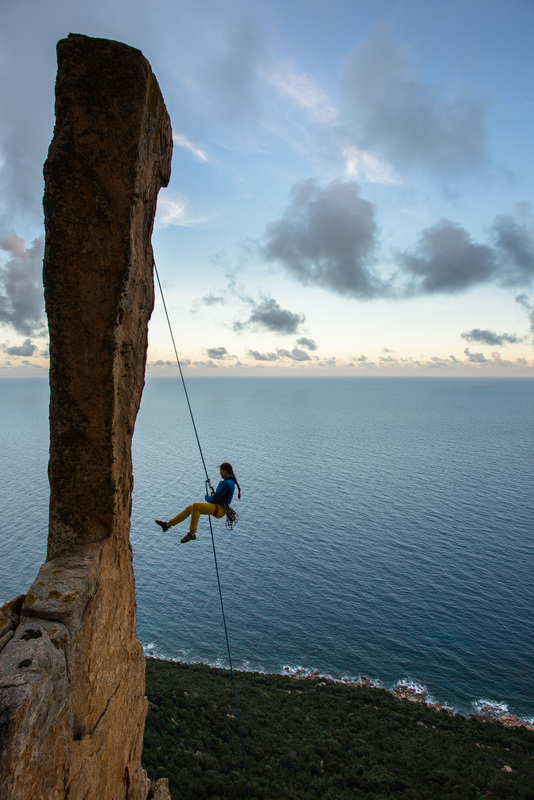 Last year I had to shoot pro climber Stefano Ghisolfi on a famous sport climbing route in Spain. There are a lot of photos around, all looking similar. How to make a difference? We shot it by night, using strobes. 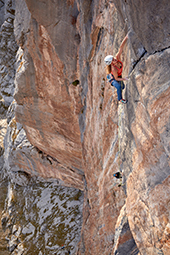 On a big wall it’s already a big compromise to bring a DSL with a single zoom lens; I went on the infamous Eiger North Face bringing a full set of prime lenses. There is always a way to make something different. :: Any big projects coming up in the new year that you’re excited about? I’m planning a couple trips to Peru and Nepal where I’ll need to climb higher than I ever did to document high-altitude climbing, so training will be my main focus in the next months. I also have a bunch of smaller photo projects, but I have to balance the time I spend working on my personal stuff versus commercial photo shoots…time is always the limiting factor, aspecially with big mountain projects where I need to invest thousands of hours in training and preparation. :: Your goal, photographically is to tell a story, sometimes entirely in a single image… what do you look for when you’re deciding what to photograph is it more shooting what you see, or do you find sometimes you have a great shot, but because it’s for a commercial product, and you can’t see the logo, that you have to redo it, or not use the image? When I’m shooting commercials I always have two goals: I want to create an image that is unique and would be worth to be published on a magazine or printed on a poster, something that athletes would be psyched to see; on the other hand it has to make my client happy, showing their products in a great way. This is not always easy and if I can accomplish this on a single image I can call it a good day. :: What do you still find as a challenge when photographing? As I was saying before, I do my best to set the bar higher and produce different content, but of course is not easy with all the photos we see today; the biggest challenge is to always produce fresh and unseen content. :: What was the best piece of advice you go when you were starting? What was one piece of advice someone told you that you later found to be not true, or exaggerated? 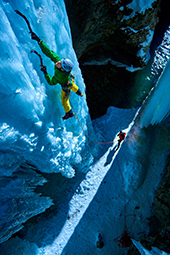 The best advice I’ve ever received was from adventure photography legend Corey Rich. I asked him about finding clients in the outdoor industry and he said: “You must create better content than what’s on the market. If you can consistently create amazing content, clients will find you.” That’s totally true, it’s useless to spend time promoting yourself if your work is not better than what’s currently available to your clients. I also heard a lot of people trying to discourage me on pursuing this career, saying that there is too much competition and it’s impossible to make a living out of it; luckily I didn’t trust them. :: Living in Europe what differences do you see between the photography communities there vs. those in the US or other places you’ve travelled? The main difference I see is that in US photographers are more willing to help a newbie; if you ask something, you will get all the answers you need. In Europe people still try to keep their knowledge “secret”; I find this quite stupid in today’s world where one can just google something and basically get every information he or she needs. Personally, I try to do my best to reply at everyone who asks me something about photography or climbing.